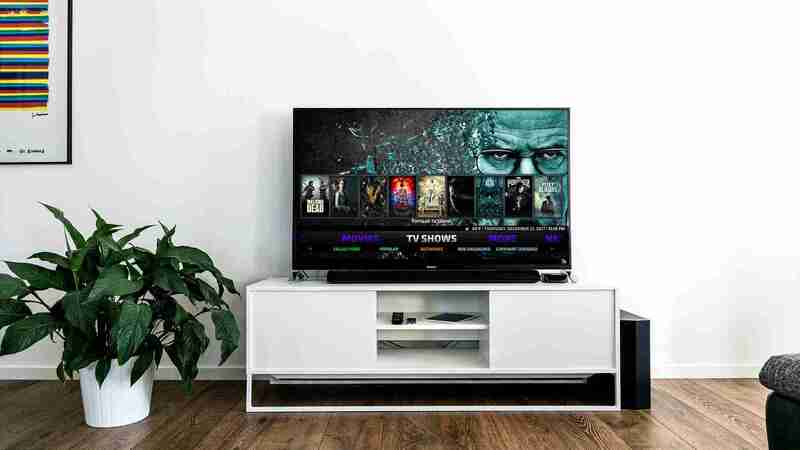 If you are an avid Kodi user then you must have heard about the Kodi builds and there are a lot of people who keep on searching for best Kodi builds. 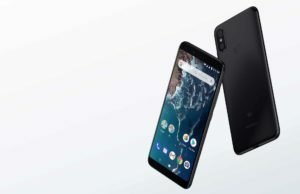 But if you are visiting here while stumbling upon, let me tell you something about Kodi and Kodi builds which are working in 2018. So, Kodi is an open source entertainment software that you can install on almost any device which is running on Windows, Android, iOS, Mac OS, Linux, Raspberry Pi which offers you wide range of entertainment. You can literally watch anything on Kodi be it Movies, TV Shows, Live TV, Music, Sports and what not. But, the real power of Kodi lies in Kodi Add-ons. 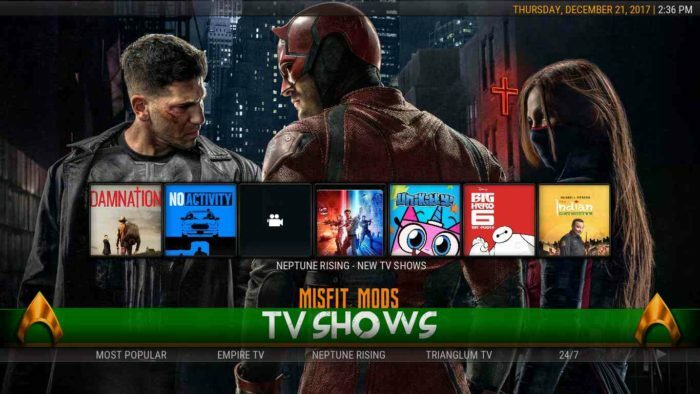 There are hundreds of Kodi add-ons that you need to install for enjoying all that great stuff. 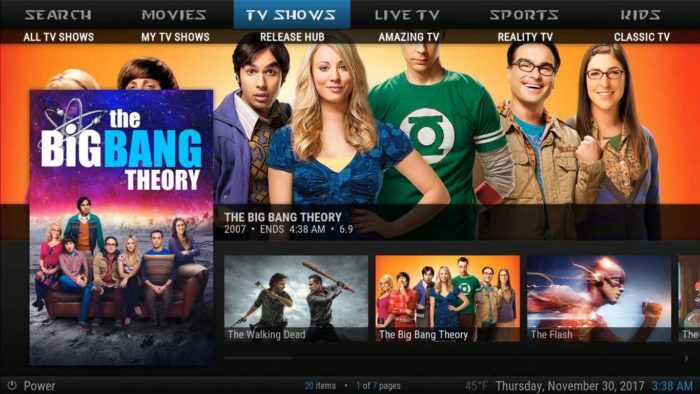 Like if you want to watch LIVE TV, then you have to install LIVE TV add-ons for Kodi and so on. Installing Kodi addons is not that easy and it does demand some basic computer or smartphone knowledge. If you don’t want to install Kodi add-ons for each service (Live tv, Movies, Sports etc.) then you can consider Kodi builds. Now, Kodi builds is kind of a package that includes pre-installed add-ons and Kodi skin. You don’t need to install each addon one by one, just install one Kodi build which fulfills your requirement and kaboom, you got everything. So, here are some of the Best Kodi Builds that you can install on Kodi. Before you proceed further, there is an important message for Kodi user. Accessing content on Kodi is not legal in some countries and you may face legal procedures for violating legal rules. To use Kodi anonymously, it is highly recommended to use IPVanish VPN. 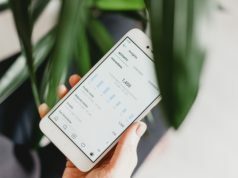 IPVanish VPN is Award Winning VPN under the category Best VPN by The T3 Award and recommended VPN by Speedtest by Ookla. IPVanish VPN is built for Kodi and with IPVanish, you can access Kodi add-ons, Kodi Builds and other geographically restricted content without getting traced. I am using this build for the pretty long time because it has almost everything I want on my Kodi setup. 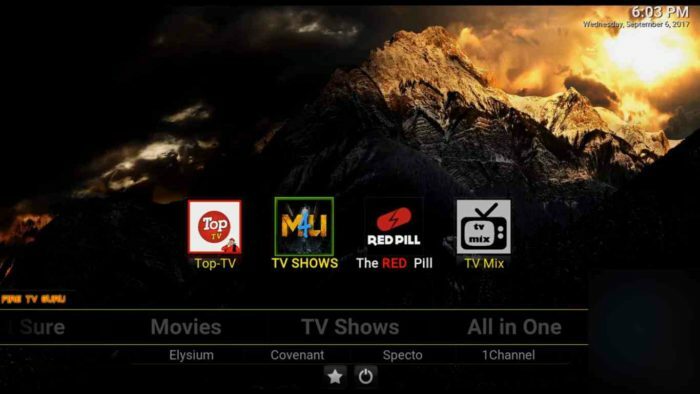 It has some of the great Kodi add-ons preinstalled including Goodfellas 2.0, Covenant (Exodus), Poseidon, Death Streams (Salts), Maverick, Supremacy and what not. No limits Magic Kodi build also has LIVE TV add-ons that have a huge collection of international channels all around the world from different categories including News, Sports, Music, Kids etc. The No Limits Magic Kodi build uses Aeon Nox 5 Silvo Kodi Skin which is pretty cool and intuitive. 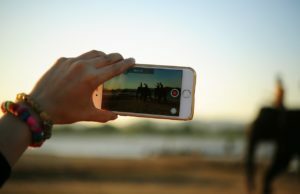 You will easily find the content you are looking. It doesn’t bother the all over user experience. This is must have Kodi build for a perfect Kodi setup. Moreover, the No Limits is one of the best Kodi Build for Android smartphones and tablets. Amazon Firestick is a great device and the good thing is, you can install Kodi on firestick without jailbreaking the firestick. Now, if you want to install best Kodi build for Firestick, you can easily do that but other Kodi builds are pretty heavy for Firestick’s technical specification. That is why the developer has done a great job by building a Kodi Build for Firestick. The FireTV Guru Kodi build is light and compatible with Firestick’s specs. There is something for everyone on FireTV Guru Kodi build from all the categories like Kids corner, LIVE TV, TV shows, Movies. This Kodi builds also has some of the really great Kodi add-ons like Supremacy, Goodfellas, Quantum, Covenant and much more. If you own the Amazon Firestick, this is the best Kodi build for the firestick. CellarDoor TV is yet another great Kodi Build. The thing which I liked the most about CellarDoor TV is its interface. The interface of CellarDoor TV is very clean and easy to use. Every content is well managed and categories which indeed enhances the user experience. Talking about the content, you will find some really great content on Fitness, Sports, Movies, Live TV, TV Shows. Movies are well categorized on the basis of their genre. While roaming through the CellarDoor TV Kodi build, I found some of the Indian TV Shows and Bollywood movies. So, if you are a Bollywood fan, this Kodi Build has something really good for Android devices and for other devices including PC. This is another awesome Kodi build that you just cannot ignore. Hard Nox is such an amazing Kodi build with the clean interface and those retro fonts. It looks so good. In the Hard Nox, you will find some of the great stuff like TV shows, Movies, LIVE TV, Kids Corner. You will find a separate category for all the Sports Stuff. 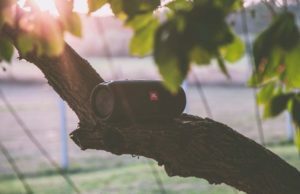 For Music lovers out there, there is something really good for you. 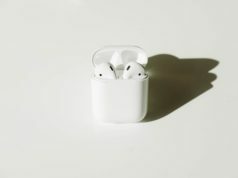 There is a huge collection of Music from different genre including latest music and old classic music. There are a few categories which ask to install Exodus for watching and Exodus is not working these days. But all over, Hard Nox Mistfit Kodi build has a lot to offer. This Kodi build is getting way too much popularity after getting an update. The whole interface of the OneAlliance is pretty interesting and different from all the above mentioned Kodi builds. 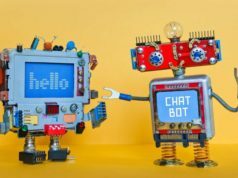 Here in the OneAlliance, you will get a great package of Add-ons for Movies, TV Shows, LIVE Sports, Kids Zone, Reality and what not. The thing I liked the most about OneAlliance Kodi build is its interface. No other Kodi build has widgets with the respective menu showing popular content. Like if you hover over to movies, you will get the widget showing you the popular movies and you can directly play them from that widget which is pretty cool. All over, this Kodi build has something unique to it, including all the regular great stuff in it. Do give it a try. Durex is another great Kodi Build that you can use for a perfect Kodi Setup. Durex is pretty popular Kodi builds and got a lot of loyal fans. This Kodi Build comes with a great package of Kodi Addons for different awesome jobs like Movies, TV Shows, LIVE TV, Music etc. The list of add-ons came in the Durex package is Covenant, Death Streams, Elysium, BoB Unleashed, Goodfellas 2.0, Poseidon etc. Durex also offers premium streaming and for that, you have to pay a certain amount to the dev of this Kodi Build through PayPal. Free Durex works really great and you will find almost everything in the free version of Durex Kodi Build. Do check out the Durex Kodi build for a complete entertainment package. 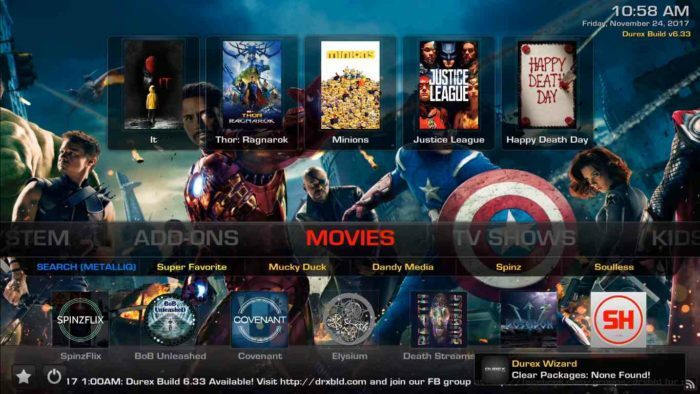 Titanium Kodi build came from Supreme Build wizard and it is one of the best Kodi builds. Like other Kodi Builds, Titanium interface is really impressive. The menu of Titanium Kodi builds includes Movies, TV shows, Kids Zone, En Espanol, Combat Zone, Music, LIVE TV, Sports Replays and much more. After installing Titanium Kodi build, you will get a clean and attractive interface and be fetching the required content is really easy. 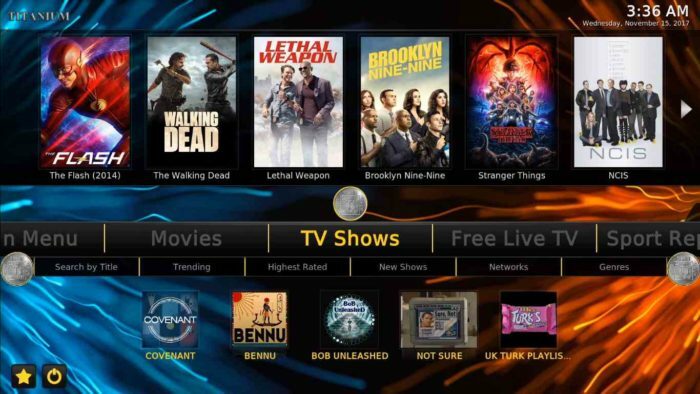 With the Titanium Kodi build package, you will get a list of best Kodi addons including Covenant, UK Turk, Bob Unleashed, Sports Devil, Goodfellas 2.0, Bennu etc. There is no problem in streaming the content and it does give you an amazing Kodi experience. For a perfect Kodi setup, do give a try to Titanium Kodi build. 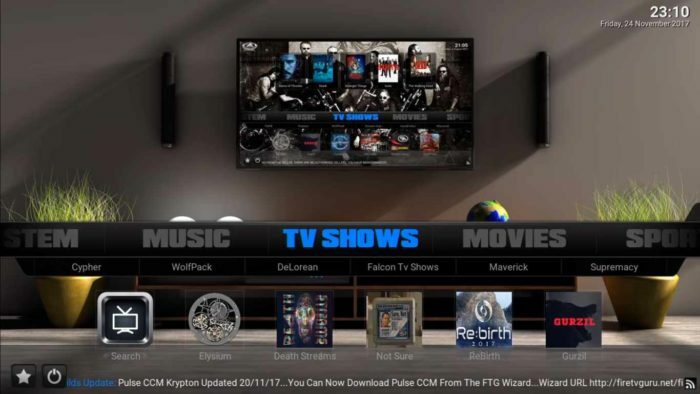 Pulse CCM is another popular and one of the best Kodi Build (that is why it is on the list). 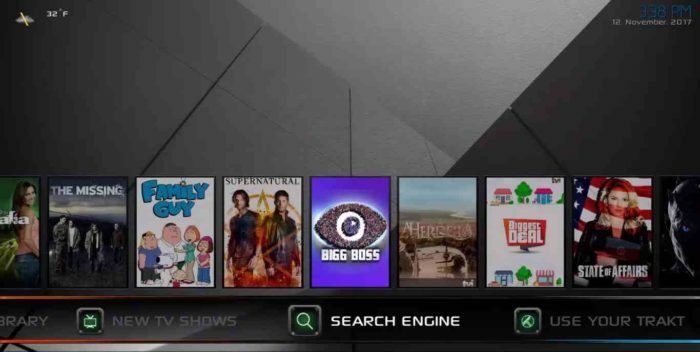 Previously, Pulse CCM came from Ares Wizard which is now no more working on Pulse CCM Kodi Build and now, this Build came from Fire TV Guru. 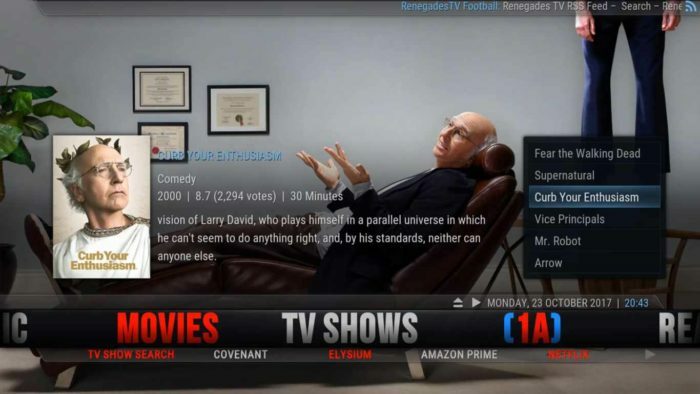 Pulse CCM also has a range of great addons with it which includes Death Streams, Elysium, Gurzil, Rebirth, Bob Sports, UK Turks, Rising Tides, Cartoon Crazy, Cartoons8, Cypher IPTV and much more. The menu of Pulse CCM is pretty simple and includes Movies, TV Shows, LIVE TV, Sports, Music, Kids Zone etc. The interface is really great with clean and easy to use menu and listing of content. Spinz TV made its debut last year, providing you a great package of the latest and working Kodi add-ons and Kodi Skin. I really liked the interface of Spinz TV. If you are using Kodi on big screen TV, I would highly recommend you to take a look at Spinz TV Kodi build. Spinz TV Kodi build comes with some of the best Kodi Add-ons including Elysium, Poseidon, Fantastic, Bob Unleashed and much more. The Kodi build provides you some of the best content including Movies, TV shows, LIVE TV, Sports, Ladies corner, Kids TV etc. There is separate space for Horror movies, Urban series etc. Every category is further categorized in subcategory which makes things pretty much easier. Moreover, the overall user interface really intuitive and clean which looks just amazing. You are definitely going to love this Kodi build. Now, this also deserves a place in the list of best Kodi Builds. Duggz is indeed a great Kodi build as it comes with some really great content. I have never seen Kodi Build that is featuring Workout TV in it. But, Duggz has it. Another great thing about this Kodi Build is 3D and 4K content. If you own a 4K TV and using Kodi in it from any source, Duggz is something you must have for perfect Kodi Setup in 4K. Along with that, there is some regular stuff in a modified and better form. The Duggz Kodi Build is just perfect for the big screen. If you are using Kodi on Desktop with 24′ inch or bigger monitor, things will go better with Duggz. 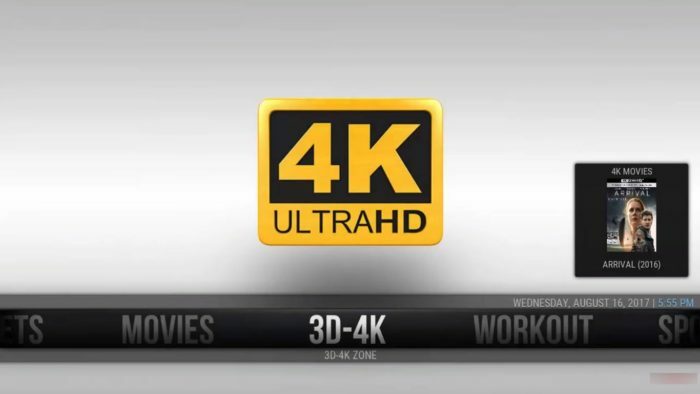 You will definitely be going to have movies, tv shows, LIVE TV, Sports and other entertainment but along with that, you will get a Workout channel and 3D-4K channel for 4K content which to me is pretty impressive. If you are going to install this Kodi build for 4K content, make sure your internet connection is blazing fast (Just to let you know). So these are some of the Best Kodi builds and for other devices that you can install on Kodi for an amazing Kodi experience. All the above mentioned Kodi builds are working and updated. You can install Kodi Builds on Android, PC, Mac. For devices like Amazon Firestick, you can install Fire TV Guru which is a popular Kodi build for firestick. If you own an Android TV Box, there the wide range of Kodi builds available for you. You can install any of them as Android TV box’s hardware is capable enough to run this Kodi builds on Kodi. A VPN is always recommended while using Kodi. IPVanish is made for Kodi and using IPVanish, you can safely access the Kodi and Kodi Add-ons. Get IPVanish here. For the best experience, make sure you have the latest version of Kodi installed. At the time of writing, I have installed these Kodi Builds and worked absolutely fine. Almost all the Kodi Builds mentioned above have similar content and menus. Although, OneAlliance Kodi build is little different in terms of its interface. That little widget on the side of OneAlliance really makes a big difference. You will find all the great Kodi addons on these above mentioned Kodi builds. All the Kodi builds mentioned above are the Best Kodi Builds and you can install any of them for perfect Kodi setup. Which one is your favorite Kodi Build? Do you have any other Kodi build? Do share it in the comments section below. No Limits Magic is really all you need. The other builds are nice but they just can’t compare to NLM. Isn’t it to big to run smoothly on the fire stick? Use Kodi build that are specially developed for Firestick.